NASA has discovered a wave of hot gas larger than the Milky Way rolling through the Perseus galaxy cluster. This X-ray image is the result of 16 days of observing with the Chandra X-ray Observatory. The image was filtered to make details easier to see. Credits: NASA’s Goddard Space Flight Center/Stephen Walker et al. An international team of scientists has discovered an enormous wave of hot gas rolling its way through the Perseus galaxy cluster. The wave is a giant version of what’s called a Kelvin-Helmholtz wave. They’re created when two fluids intersect at different velocities: for example, when wind blows over water. In this instance, the wave was caused by a small galaxy cluster grazing the Perseus cluster, and setting off a chain of events lasting billions of years. The findings appear in a paper in the June 2017 issue of the journal Monthly Notices of the Royal Astronomical Society. “The wave we’ve identified is associated with the flyby of a smaller cluster, which shows that the merger activity that produced these giant structures is still ongoing.” – Stephen Walker, NASA’s Goddard Space Flight Center. The Perseus galaxy cluster, also known as Abell 426, is 240 million light years away, and is about 11 million light years across. It’s one of the most massive objects we know of, and it’s named after the Perseus constellation, which appears in the same part of the sky. Galaxy clusters are the largest gravitationally-bound objects in the Universe. Most of the observable matter in galaxy clusters is gas. But the gas is super hot—tens of millions of degrees hot—which means it emits x-rays. X-Ray observations of Perseus have revealed several features and structures in the gas structure of the cluster. Some of them are bubble-like features caused by the super-massive black hole (SMBH) in NGC 1275, the Perseus cluster’s central galaxy. Another of these features is known as “the bay.” The bay is a concave feature which couldn’t have been formed by the SMBH. The bay is a puzzle because it doesn’t produce any emissions, which would be expected of something formed by a SMBH. The bay also doesn’t conform to models of how gas should behave in this situation. The lead scientist behind the study is Stephen Walker at NASA’s Goddard Space Flight Center. Walker turned to the Chandra X-ray Observatory to help solve this puzzle. Existing Chandra images of the Perseus cluster were filtered in order to highlight the edges of structures, and to make any subtle details more visible. These filtered and processed images were then compared to computer simulations of galaxy clusters merging. John ZuHone, an astrophysicist at the Harvard-Smithsonian Center for Astrophysics, has created an online catalog of these simulations. “Galaxy cluster mergers represent the latest stage of structure formation in the cosmos.” -John ZuHone, Harvard-Smithsonian Center for Astrophysics. “Galaxy cluster mergers represent the latest stage of structure formation in the cosmos. Hydrodynamic simulations of merging clusters allow us to produce features in the hot gas and tune physical parameters, such as the magnetic field. Then we can attempt to match the detailed characteristics of the structures we observe in X-rays.” -John ZuHone, Harvard-Smithsonian Center for Astrophysics. This alternate image of the Perseus galaxy cluster shows the wave at the 7 o’clock position. Image: NASA’s Goddard Space Flight Center/Stephen Walker et al. One of the simulations matched what astronomers were seeing in Perseus. In it, a large cluster like Perseus had settled itself into two regions: a colder region of gas around 30 million degrees Celsius, and a hotter region of gas at almost 100 million degrees Celsius. In this model, a cluster smaller than Perseus, but about a thousand times more massive than the Milky Way passes close to Perseus, missing its center by about 650,000 light years. That happened about 2.5 billion years ago, and it set off a chain of events still playing itself out. The near miss caused a gravitational disturbance that created an expanding spiral of the colder gas. An enormous wave of gas has formed at the edge of the spiral of colder gas, where it intersects with the hotter gas. This is the Kelvin-Helmholtz wave seen in the images. The study provided another benefit besides just spotting an impossibly enormous wave. It allowed the team to measure the magnetic properties of the Perseus cluster. The researchers discovered that the strength of the magnetic field in the cluster affected the size of the wave of gas. It the field is too strong, the waves don’t form at all, and if the magnetic field is too weak, then the waves would be even larger. According to the team, there is no other known way to measure the magnetic field. 30 years ago today, a supernova explosion was spotted in the southern hemisphere skies. The exploding star was located in the Large Magellanic Cloud — a satellite galaxy of the Milky Way – and Supernova 1987A was the brightest and nearest supernova explosion for modern astronomers to observe. This has provided an amazing opportunity to study the death of a star. 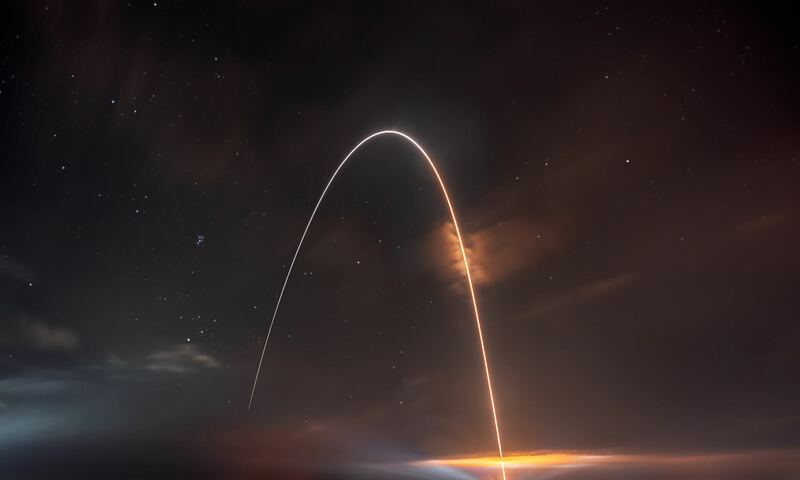 Telescopes around the world and in space have been keeping an eye on this event, and the latest images show the blast wave from the original explosion is still expanding, and it has plowed into a ring expelled by the pre-supernova star. The latest images and data reveal the blast is now moving past the ring. Got a 3-D printer? You can print out your own version of SN1987A! Find the plans here. Two different versions of 3-D printed models of SN1987A. Credit: Salvatore Orlando (INAF-Osservatorio Astronomico di Palermo) & NASA/CXC/SAO/A.Jubett et al. Below is the latest image of this supernova, as seen by the Hubble Space Telescope. You can see it in the center of the image among a backdrop of stars, and the supernova is surrounded by gas clouds. Hubble launched in 1990, just three years after the supernova was detected, so Hubble has a long history of observations. In addition, the Chandra X-ray telescope – launched in 1999 – has been keeping an eye on the explosion too. This scientific visualization, using data from a computer simulation, shows Supernova 1987A, as the luminous ring of material we see today. Here’s a link to the original astronomer’s telegram announcing the detection. Astronomers estimate that the ring material was was ejected about 20,000 years before the actual explosion took place. Then, the initial blast of light from the supernova illuminated the rings. They slowly faded over the first decade after the explosion, until the shock wave of the supernova slammed into the inner ring in 2001, heating the gas to searing temperatures and generating strong X-ray emission. The observations by Hubble, Chandra and telescopes around the world has shed light on how supernovae can affect the dynamics and chemistry of their surrounding environment, and continue to shape galactic evolution. 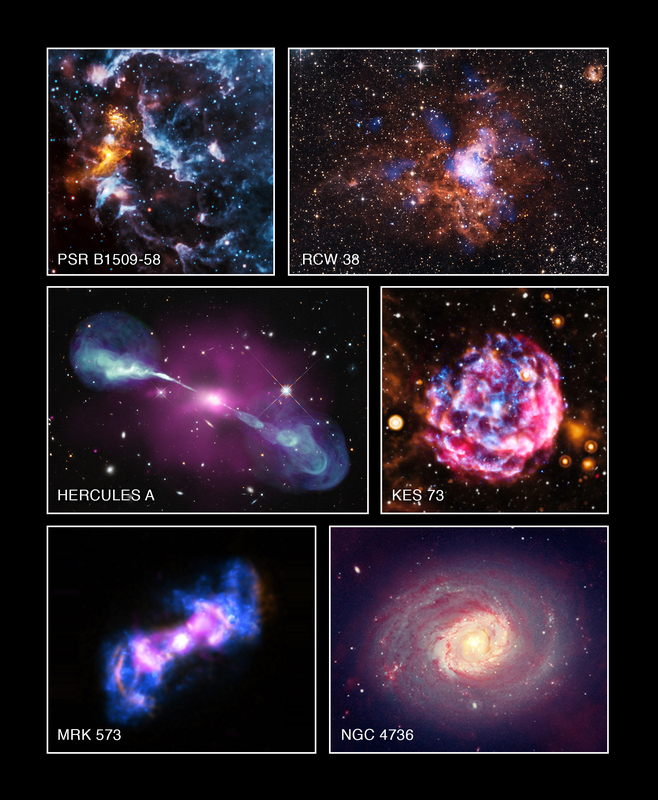 See additional images and animations at the Chandra website, ESA’s Hubble website , and NASA. What a gem! This huge black hole in the middle of Hercules A is making gas around it super-heated to millions of degrees, making it shine brightly in X-Rays. The Chandra X-Ray Telescope captured the scene and in a new data release this week, telescope officials cracked open the archives to give us gems such as this. The release comes as a part of American Archives Month, where every year Chandra officials go through the archives and pull out old Chandra data, combining it with the work of other telescopes to get as much information as possible about the objects being studied. Chandra is one of three NASA “Great Observatories” still active, with the other two being the Hubble Space Telescope and the Spitzer Space Telescope. It’s been in operation now for more than 15 years. You can see the six new pictures below. To read more about each of these objects, head on over to this link. It’s well past the Fourth of July, but you can still easily find fireworks in the sky if you look around. The Chandra X-Ray Observatory has been doing just that for the past 15 years, revealing what the universe looks like in these longer wavelengths that are invisible to human eyes. Just in time for the birthday, NASA released four pictures that Chandra took of supernova (star explosion) remnants it has observed over the years. The pictures stand as a symbol of what the telescope has shown us so far. The telescope launched into space in 1999 aboard the space shuttle and currently works at an altitude as high as 86,500 miles (139,000 miles). It is named after Indian-American astrophysicist Subrahmanyan Chandrasekhar; the name “Chandra” also means “moon” or “luminous” in Sanskrit. And there’s more to come. You can learn more about Chandra’s greatest discoveries and its future in this Google+ Hangout, which will start at 3 p.m. EDT (7 p.m. EDT) at this link.